These precious days are producing a truly memorable chapter in an event dating back to 1927. Even the European Tour have been prompted to acknowledge this particular Dubai Duty Free Irish Open as the easiest staging in recent years, due to the professionalism of their Donegal hosts. Special credit goes to Ballyliffin Golf Club for delivering a links which represents the very best this proud golfing island has to offer. And while the weather has contributed hugely, sound preparatory work virtually guaranteed a handsome dividend. A holiday atmosphere out on the course has been redolent of glory days at Portmarnock and Royal Dublin three decades ago. Indeed memories were evoked of Dollymount in 1983, when similarly brilliant sunshine marked the first of three Irish Open triumphs by the inimitable Seve Ballesteros. At a time when our international image was decidedly modest as a location for significant tournaments, Richard Stillwell, the newly-appointed greens superintendent at Royal Dublin, promised to have greens running at Augusta National speed. That was in January when sceptics abounded, eight months prior to the event. I can still recall the Saturday of Irish Open week when Stillwell eagerly sought me out to impart the news: "I've done it. Come." And he brought me to the brown expanse of the 17th green where hardly a blade of grass was visible. The green, he enthused, was running at 11.0 on the Stimpmeter, just like Augusta. As a measure of how much agronomy here has changed in the intervening years, they've had to slow down the Glashedy greens, fearing unscheduled winds might make them excessively slick. In fact they're to be quickened from about 11 to 12 for Paddy McDermott's Captain's Prize next Saturday. Out on the course, there was a heightened sense of regret that Pat Ruddy, who was entrusted with the design contract with his partner Tom Craddock in 1993, has been unable to attend for health reasons. In fact he informed me that he's an extremely reluctant patient, quite a handful for caring medics. Close on 25 years ago, Ruddy experienced a different sense of drama when the short 14th at Glashedy was being constructed. He explained: "The plan called for it to be a par-three from a tee on top of the long, tall sandhill to a green below. The problem was that a vociferous minority within the club liked that particular hill, which had been broken open into a jagged shape by the wind. They wanted it to be kept just as it was. "Civil war was threatened if the hill was touched. To my great relief, however, the development committee eventually gave the nod for the job to go ahead with the plan I had devised. So it was that two bulldozer men, two excavator operators and a dump-truck driver agreed to come to work at 11.0pm on a wet and windy February night. "We worked through the night by the lights of those machines. It was cold, it was crazy and I was the only one standing out in the elements for 10 hours of darkness. By daybreak, however, the hole had been built and nobody came out to complain." With a backdrop of Glashedy Rock and terrain tumbling in giant steps from the tee to a green 80 feet below, it has won many admirers. Describing the course overall as "absolutely stunning", defending champion Jon Rahm added: "The views from the seventh and 14th tees are probably some of the prettiest sights you'll get in golf. It's really beautiful." Another champion, however, was somewhat muted about the 14th. "I don't like the green, which would be almost impossible to hold downwind," said 2014 Irish Open winner Mikko Ilonen, who had a three-putt bogey when it played into the wind on Thursday. The 38-year-old Finn arrived for this, his 13th appearance in the event, in special circumstances. From last Sunday's French Open in Paris, he flew to Dublin and stayed the night in Carton House. Then, early on Monday morning, he was whisked off by prior arrangement to Enniscrone to be conferred with honorary life membership in this, the club's centenary year. After winning the West of Ireland Championship as a 19-year-old at Enniscrone in 1999, Ilonen's parting words to club officials were: "One day I will be back." While admitting that his return has been in the planning stage for "quite a while", it finally came to pass last Monday. Enniscrone is, in fact, only the third club to have so honoured him, the others being Lahti Golf in his homeland and the Golf Club of Georgia in the US. A measure of the bond established 19 years ago is that the Finn arranged complimentary Irish Open passes for "some people from the club". Then the player, who has five European Tour wins to his credit, admitted: "I wasn't that good, even when I won the [British] Amateur the following year, but I learned how to play links golf." Of his European wins, Fota Island holds special significance for him. "It was big for me because I was leading from the beginning," he said. "I played with [Jose Maria] Olazabal for the first two days when I went really low. And he said: 'Don't look back'. And I went on to win from there, going to bed each night with the lead. 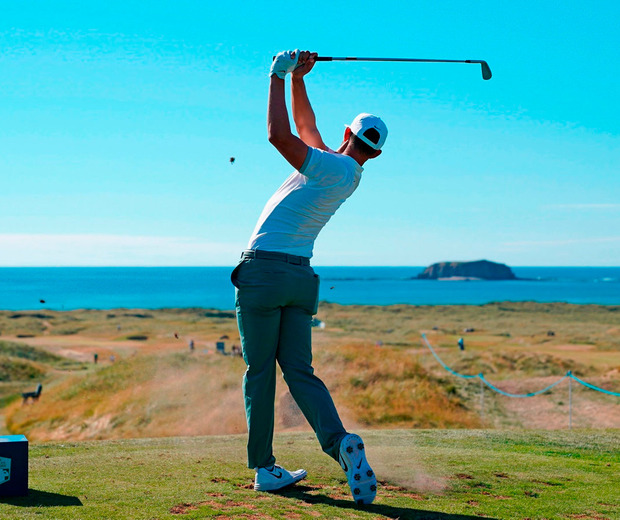 "It was crucial that the Finnish Federation made those trips to Ireland [starting in 1999] and I now intend to send messages to my golfing friends telling them that I may have found a good spring camp [Enniscrone] for the future. I'm sure I'll get some people there." He went on: "Links experience teaches you to recognise the difference between difficult and easy. Earlier this week, I met this Swedish guy who was playing links golf for the first time. And he wondered at the talk about a certain hole which was only a five-iron and a wedge. He didn't understand that when the wind turns around, it will become a drive and maybe a three-iron. So he will learn. "I would place this course very high on the links courses I've experienced. It's a lovely piece of land and a great design. And you'd know it's fairly new, with level fairways and no knuckles. That's the giveaway." Agronomy is only one of many changes in tournament golf since those heady days of 1983. That was when Dave McNeilly's yardage books were de rigueur and he had just decided on a career in caddying, which would lead him to work for such distinguished practitioners as Nick Price and Padraig Harrington. In 2012, he prevailed upon his employer at the time, Matteo Manassero, to play in the Irish Open at Royal Portrush. Now, he's the bagman at Ballyliffin to another promising young player, England's Matt Wallace. McNeilly approached Wallace during last year's Irish Open at Portstewart and they got together at the Scottish Open the following week. On being diagnosed with prostate cancer four years ago, McNeilly was given an MRI scan. "When it showed my spine, there was a massive, 45-degree kink at the base," he said. "The medics were amazed, telling me my spine was crooked. It was only when I explained that I have been caddying for a living since 1982, that they began to understand. "It was caused by the compression of carrying a golf bag. The good news was that I developed such strong muscles around the affected area that there was no cause for concern." Which, he was pleased to add, also applies to the prostate problem. The family nature of this weekend made for some charming images. Like the sight of a mother casually wheeling her triplets around the clubhouse area in a suitably wide pram. Then there was the lad with a T-shirt carrying the laudable ambition: 'I want to see the world'. Another scene involved a young lady of similar age being taken by her father to meet Andrew Coltart, the Sky commentator. "There's the course record-holder," she was told. Whereupon her programme and a golf ball were autographed by the player who shot a 66 over Glashedy Links in the North West of Ireland Open of 2002. In fact the record no longer stands because of all the course changes since then. Not that Coltart seemed bothered. "I remember battling the wind on tough days and enjoying the golf course on the other two days," he said. "I think it's a superb, classic links. "When you drive through the course as I've done this week, you note that the bunkering is proper. It's precisely where the balls are going to finish if they're slightly off line. I heard of some guys complaining about it and I can only conclude that they've no understanding of the links game." Then with typical Scottish passion, he concluded: "This is the true game; the way the game is meant to be played." And he would have got no argument from delighted hosts.